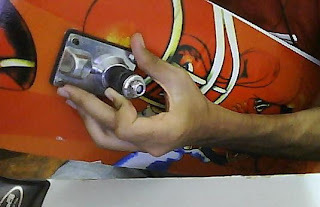 20 September 2011: I bought a skateboard yesterday and i did practice it at home and at the park. I was having fun until i broke the skateboard trunk and it cannot be fix it. Oh nevermind, cheap skateboard by the way. I bought it Rm37 after discount. I should have known it is made in China lol. I just think of buying a new one, i mean the original and expensive skateboard and the price would be around Rm200-300. But then, i was thinking that it is not in the life direction list. Why should i waste my money on a skateboard? This is not important for me. I have a "Life direction list", i called it life direction list because it shows my direction and this list is really important for me. In the list, i wrote down the things i need to have, one of them is a blackberry cellphone. Yes, i mean "things". I don't want to list all of the things here! It should be keep in secret hehe. Okay, but i can tell you the most important thing in the list is the passport. Without it, i cannot go there. P/s: Oh, I did go to the 7 Eleven for the interview that day and I have to wait for two days and wait for their call.